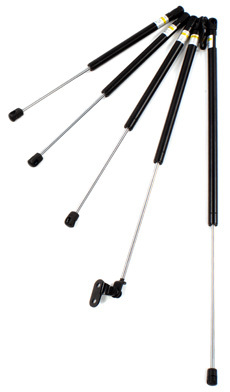 The Lesjöfors gas spring design system was accredited in 2005 to ISO/TS 16949 2002 standard. The gas springs are manufactured by Lesjöfors and Hanil Precision joint venture company, Lesjöfors Gas Spring LV, according to ISO/TS 16949 standard. All manufacturing fulfils the demands of environmental standard ISO14001:2004. Due to the high and constant pressure within the chamber, gas springs have a maximum life span, shortened by the regular movement of the piston and exposure to the elements. There are also several external factors which can cause a gas spring to fail! Dirt and other external particles can build up on the piston rod while extended, which are then mixed with the nitrogen and lubricating oil once compressed, leading to slight defects in the chamber seal. Once the seal has become worn or damaged, nitrogen and oil are allowed to escape, reducing the force of the spring and resulting eventually in complete failure. Additionally, whilst the end seals are made from a special kind of rubber, they will naturally age and degrade over time, and Lesjöfors therefore recommends that stockists operate a 'first in, first out' policy.